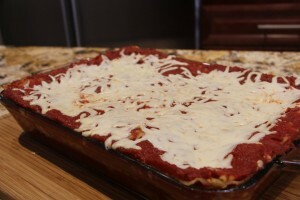 This video is about making home made Lasagna,using my home made sauce that I canned. Its quick,easy and oh so yummy! Nice and cheesy. Give it a try, a hit with my family! In a saucepan, simmer the homemade sauce. Boil water in a saucepot and once it boils add salt to it. Place noodles in the water and cook al dente. In a large bowl, combine mozzarella cheese (reserving 1 cup) and ricotta cheese. Mix well. Pour ladles of sauce in casserole dish and layer with noodles. Top with mixture of cheese. Repeat layering in same way until lasagne is over. Sprinkle mozzarella cheese over the top. Cover with aluminium foil, pop into oven and bake for 30-45 minutes.